Doll Quilt 16" x 18"
My Spring Time dolls quilt is a very easy quilt to make. It would make a lovely gift for any wee girl and could be made in a day. The perfect birthday gift! This quilt measures 16" x 18". 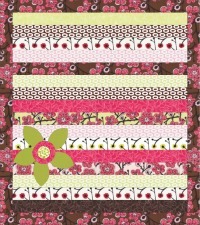 If you need to make it larger or smaller then this is easy to do with a strip quilt. Either add or reduce the number of strips you use in the quilt and/or make each strip longer or shorter than in the pattern. It is a very versatile pattern! Like most quilts being made for dolls it requires small pieces of fabric. 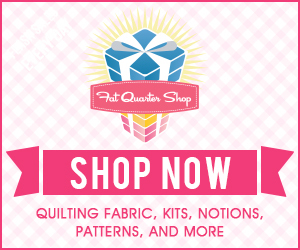 Most quilters will have this in their stash. If you don't and you are wanting to keep the cost down my suggestion is to buy fat quarters in a limited color range. I have used 13 different fabrics whereas you could choose only 4 or 5 different fabrics and have more repetitions of each fabric in the quilt. It will still look a very cute doll quilt when finished. Below the pattern I have given simplified instructions for making the appliqué flower. For fuller instructions go to my free appliqué tutorial. 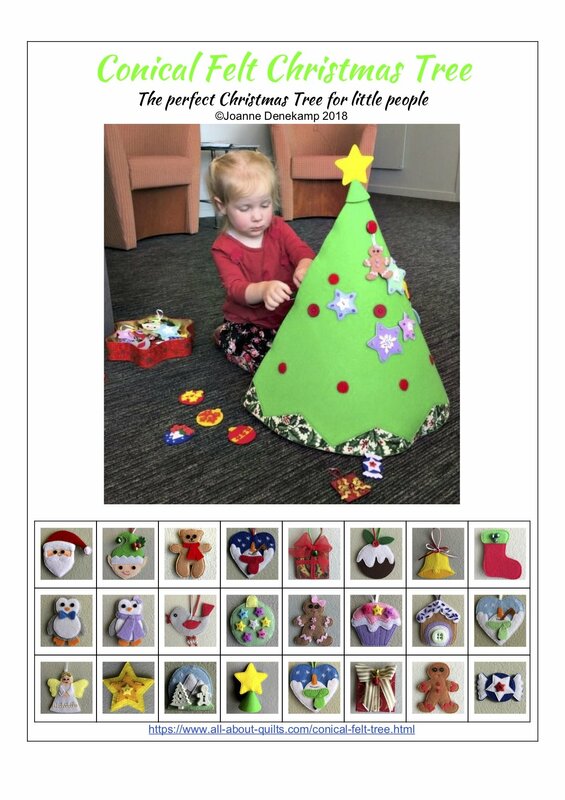 To download the PDF pattern and the templates click on the pattern images below. 1. 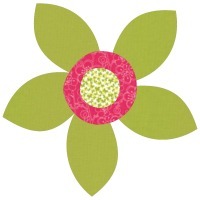 Trace around the appliqué flower template onto steam-a-seam. It is best to keep all the pieces to be made out of the same fabric together. Rough cut around each piece - not on the lines but about a 1/4" or so away. 2. Peel off & discard the paper backing that doesn't have the pattern drawn on it. Then place the template on the wrong side of selected fabric. Press. 3. Cut out carefully along lines. 4. Peel off the second paper and discard. Position flower right side facing onto the lower left corner of the quilt top. 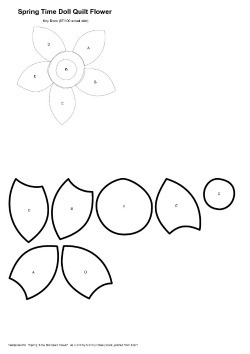 Position the petals (A, B, C, D, & E)first then add the larger central piece (F) and lastly the very center piece (G). Press. If you have an appliqué pressing sheet then I would advise assembling the flower on this first. When assembled then move the flower unit onto the quilt. 5. Machine stitch around the appliqué using your preferred stitch, beginning with the petals first. I use a blind stitch in matching thread. 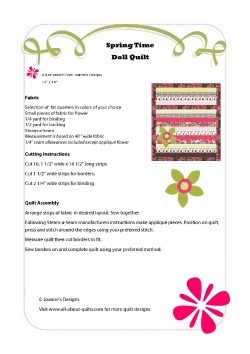 Have fun making your Spring Time doll quilt!